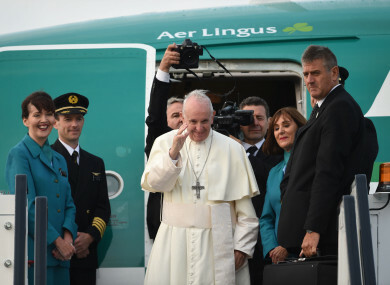 As of 1 November, the OPW had spent €15,754,639.37 on the visit of Pope Francis to Ireland. THE ESTIMATED FINAL budget for what the Office of Public Works (OPW) spent on the visit of Pope Francis to Ireland is approximately €18 million. The pontiff paid a two-day visit to Ireland coinciding with the World Meeting of Families at the end of August. His itinerary here including a meeting with President Michael D Higgins in Áras an Uachtaran after arriving at Dublin Airport on Saturday 25 August, a swift parade through Dublin city centre, a trip to Knock the following day and a two-hour Mass in the Phoenix Park. Around 500,000 people were expected at the Phoenix Park Mass but estimations put the numbers at much lower than that – around 130,000. Nevertheless, the degree of planning that went into the various events around the Pope’s visit came at a cost to the State. At the request of the Public Accounts Committee, the OPW provided a breakdown of costs as of 1 November, when the total stood at €15,754,639.37. The most expensive items were camera platforms, media risers, trackway, fencing and standby crew provided by Actavo – formerly Siteserv. This cost €4.92 million. The next highest was the preparation of an event management plan, drawings, event control coordination, car parks management and route management. Provided by EOBA, this cost just over €2 million. A total of €1.19 million was paid to Eventus for marquee hire, site area hire, portable chemical toilets, luxury toilets, screening marquees, portacabins and astroturf decking. Mongey Communications received €1.2 million for CCTV, walkie talkies, fibre installation, a central control room and fuel for generators. Between two companies – Pulse Security and Eventsec – the OPW paid €1.64 million for stewards. Works to Phoenix Park gates from one company cost €244,025, while a range of technological services cost €1.4 million. Catering supply – provided by With Taste – cost €76,845. Cleaning works, road sweeping and waste disposal cost almost €650,000 during the Pope’s visit. Figures released to TheJournal.ie also show that visit cost RTÉ an additional €136,000 in costs across TV and radio for presenters, guests and crew in studio, construction costs for off-campus sites, travel and the hiring of broadcast equipment. Email “€1.6 million on stewards and €76k on catering: How much the Pope's visit cost the taxpayer”. Feedback on “€1.6 million on stewards and €76k on catering: How much the Pope's visit cost the taxpayer”.